I’m turning 38 this week. I don’t tell you this so you can run out and get me a gift and/or a card and/or a cake and/or plan a party for me — though yes, any or all of that would be appreciated. It’s more that I need to remind myself that I’m not turning 40 this year. Because all of a sudden, I feel like 40 is right around the corner and I’m not ready for it just yet. It was a couple weeks ago that all of this really hit me. I started to think about my dad, and when he turned 40, and how I’ll be 40 in two years … and suddenly I was, like, OH MY GOD I’M GOING TO BE 40 REALLY SOON!!!! There is no way that in two years I am going to be as old as my dad was when he turned 40. When my dad turned 40, I was 11 years old. My dad had a spouse, two kids, and a big house. He owned a business, and was an important person in the community. We had a surprise 40th birthday party for him at the house after going to the Islanders game that afternoon, lots of people were there, and it was a really big deal. Why? 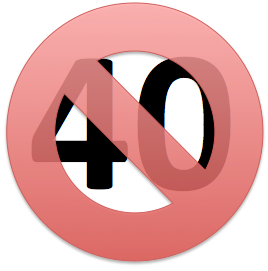 Because 40 was a big deal. Forty was old. Like it or not, I’m going to be 40 in two years. How is that possible??? I don’t feel as old as that, I don’t act as old as that, and I sure as hell don’t think I look as old as that. It’s worth noting that I have friends who’ve turned 40 recently, and I don’t consider them old. That’s because 40 today is different from what 40 was 26 years ago. I understand that. But there’s something about comparing myself to my dad when he turned 40 that’s making me feel old all of a sudden. So I need to remind myself that I’m not turning 40 this year, I’m turning 38. And I’m in a good place and I’m happy. Forty will happen and it will be fine. I’ll accomplish all the things I want to, all in due time, whether it’s before I turn 40 or after. In the meantime, I can enjoy being 38. I’m still young, and I will be for a long time. This is SO true! I’ve been 38 since Feb and it’s definitely not 40! I have found myself really thinking about “what I want to be when I grow up”, thinking I’m not there yet when it comes to work. Guess that’s partly due to having kids and focusing on that part of my life. Anyways, it’s fun reading your musings and being “in touch.” Enjoy the day on Thursday!